Coming soon to a television near you – the glorious gardens and magnificent period features of this grand country house set in the tranquil beauty of Northumberland. Described by an experienced estate agent as one of the best modern mansions, he has seen, Halton Grange will feature in promotional films about Northern property, as well as a Channel 4 series about beautiful interiors, as owner Anne Holliday explained. “Television crews have filmed at the house three times and they’re here because it’s beautiful. 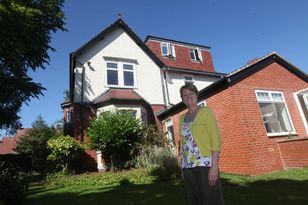 One crew wanted to show that these sort of large properties weren’t just in the South East but in the North too,” she said. Halton Grange is in the charming Tynedale village of Wall, surrounded by rolling fields yet close to Hexham and the A69. It has been the home of Anne, 57, and Alex, 58, for seven years. “We just loved it when we saw it,” she said. “Where we lived before we couldn’t do what we wanted so we bought what we wanted with a swimming pool and tennis court. “It’s a big house but not too big, it has five bedrooms in the main house and a separate annexe with a bedroom. It was built in 1913 and has period features, high ceilings, lots of cornices and archways. “It has been extended dramatically since 2004. The previous owners did that. They were also called Holliday strangely, Judith and Terry, and their name was spelt the same as ours! It was a little bit bizarre. They did all the rebuilding and the renovations, built the swimming pool and the extension. We just moved into it as it was. Outstanding features of the impressive detached property include a garden room with double doors on to the terrace and panoramic views of the Tyne Valley, the 46ft kitchen with handmade cabinets and furniture, and the leisure wing. This houses the pool, changing area, Jacuzzi and steam room and solarium room and complements the all-weather tennis court, stables and snooker room. Halton Grange, Wall, near Hexham, is for sale at £4m through Sanderson Young, tel: 0191 223 3500.